The Galaxy S10 could be the first smartphone on the market to come with UFS 3.0 storage. 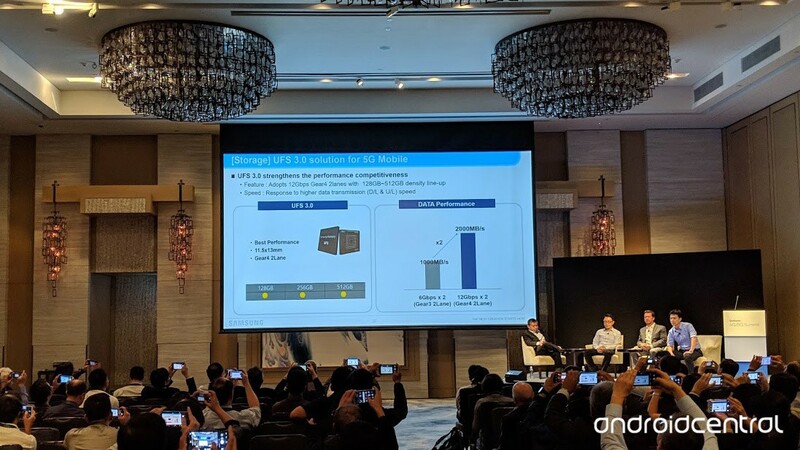 The UFS (Universal Flash Storage) 3.0 standard was announced earlier this year, and Samsung has confirmed at Qualcomm’s 4G/5G Summit in Hong Kong that we will see UFS 3.0 storage in products in the first half of 2019. The Galaxy S10 wasn’t mentioned, but it may well have the newer UFS storage at its heart. UFS 3.0 storage offers double the memory bandwidth over UFS 2.1 and will go hand in hand with the arrival of 5G networks next year. Samsung has a 5G-enabled Galaxy S10 variant in the works, and it’s possible UFS 3.0 will only be seen on that 5G model. The cheapest Galaxy S10 model could have 64GB of base storage according to our sources, and since UFS 3.0 is said to be offered in 128GB, 256GB, and 512GB variants, there’s a small chance Samsung will reserve UFS 3.0 storage for the 5G Galaxy S10 and only make it mainstream with the Galaxy Note 10 or Galaxy S11. The Qualcomm summit also revealed an interesting bit about smartphones in general. According to Micron, one of the big names in solid-state storage and flash memory production, we will see smartphones with 1TB of internal storage in 2021. That’s a long time to wait, but with 512GB storage now an option on flagship smartphones, it wouldn’t be surprising to see Samsung (and other companies, such as Apple) offering 1TB variants of their phones before 2021.